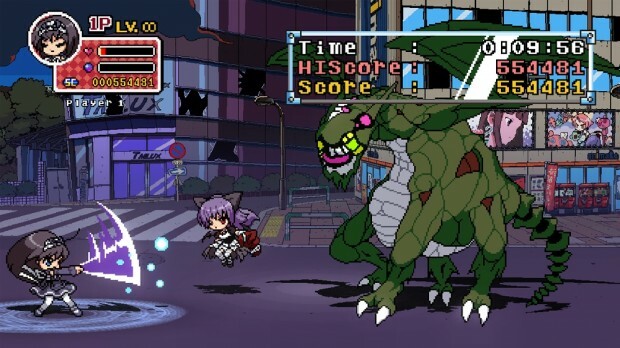 The XBLA game is actually a spinoff of Phantom Breaker, a retail fighting game released in Japan by 5pb, however the presentation ensures no prior knowledge of the characters or story is required. 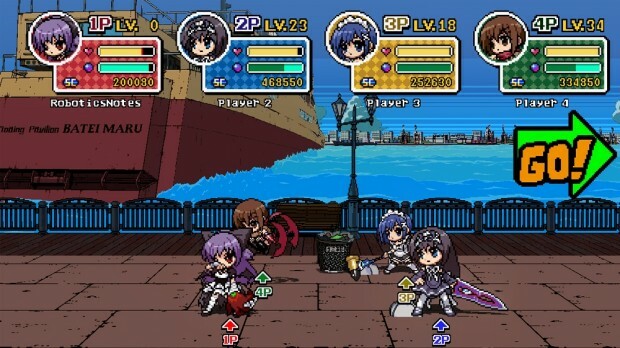 The game is bundled with four modes including Story, Arcade, Co-op, and a PvP Battleground mode. Both multiplayer modes can be played online or offline but do not allow for you to bring your couch buddy into online territory. Lots of Content – For the 800 MSP price tag there’s a lot of content to enjoy in Phantom Breaker: Battle Grounds. The game provides you with four starting characters and a decent number of color schemes for each sprite. Each character has a different weapon and skill set they can upgrade and on completion of Story Mode, four more characters are unlocked along with a Hard mode. If players are also able to beat Hard difficulty then there are a further two secret characters to collect along with a new Nightmare difficulty. The bonus characters cannot be used in Story Mode however they can be leveled up and used in all other game modes. There are eight levels of a decent length to play through on Story with a few bonus scenes to enjoy in Arcade and Co-op. Whilst a single playthrough could probably be completed in 4-5 hours, each character is different enough to warrant multiple re-plays. To top it off, the game also comes with its own player vs player Battleground mode, which is almost like a mini fighting game in it’s own right. Deep yet accessible – Unlike in some brawlers the starting characters in Phantom Breaker: Battle Grounds never feel weak. Check points are extremely fair and pushing through with an under-leveled character never feels like a massive grind. It’s a great pick-up-and-play game and certainly the more casual gamer can enjoy button bashing their way through Easy mode. However for those interested in mastering the game, there’s a lot to learn. Since the game is a spin-off of a fighting game, you can use the d-pad in combination with the attack buttons to produce a wide variety of combo attacks and special moves. 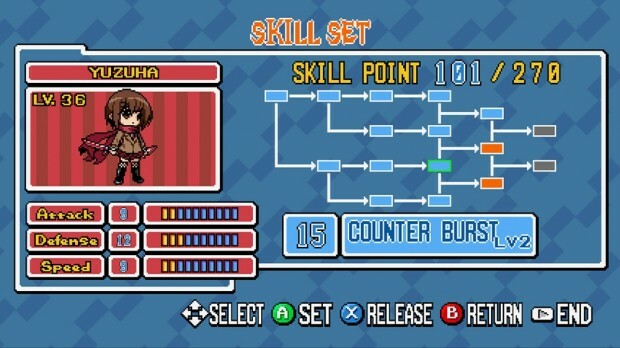 Players can also level up their characters choosing to add points to Strength, Defense and Speed or alternatively adding them to the skill tree to unlock more special abilities. Retro Style – The game’s graphics are adorably retro and are combined with a superb 8-bit soundtrack that will make you think you’re playing an old school arcade game rather than a brand new release. The backgrounds are based on real Tokyo districts and the characters have a cute wide-eyed look that anime fans will lap up. The entire presentation is bright and colorful giving the game a real fun feel. 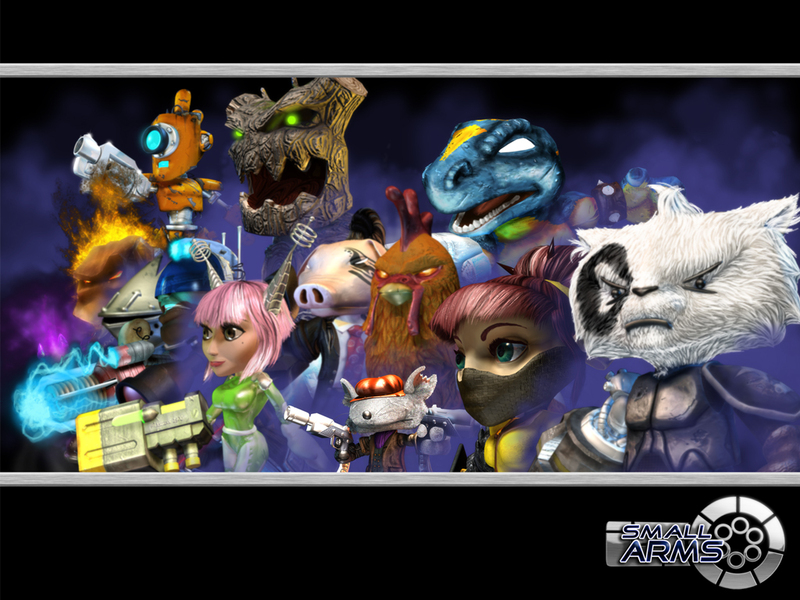 No Co-op Story – If like us you like to jump straight into co-op mode, you may be left somewhat confused. That’s because co-op mode in Phantom Breaker: Battle Grounds is essentially the same as the stripped down arcade mode containing no dialogue. There’s also no option to access the skill set between rounds meaning co-op players need to quit out to the main menu to level up. Whilst it would be understandable to want to switch the dialogue off in co-op, especially for those wanting to play online, it would have been nice to allow the option for offline co-op partners to enjoy the story together rather than having to play through on your lonesome ownsome first in order to get a grip what actually going on. Similarly we understand that no one likes waiting for others to mess around with their stats between rounds when playing online, but the option to do this during offline co-op should have be included. Xbox D-pad – Given the depth of the fighting mechanics our Xbox 360 controller somewhat struggled with identifying the differences between some of the directional inputs. For instance a single push down and A can produce an awesome fighting move, however since double push down changes lanes we often found our characters jumping to the back and punching the air at inappropriate moments. Whilst the may be the fault of the control pad rather than the game, we also found that LB also changes lanes too so it seems odd to keep the move mapped to double down as well. 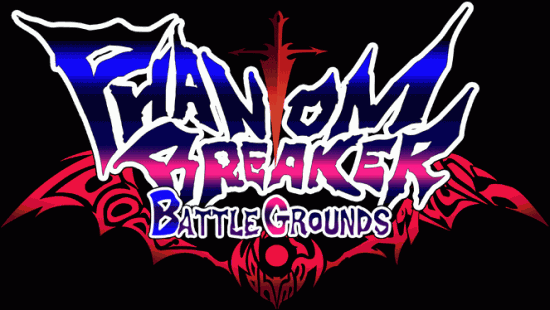 Overall we found Phantom Breaker: Battle Grounds to be a highly entertaining game. It’s best played with more than one player so it’s various offline and online multiplayer options are a godsend. For 800 MSP it provides excellent value with plenty of unlocks to keep you coming back. Deeper than your average brawler yet with a bright and breezy presentation that makes it an ideal game to blow off some steam.